No secret here, I love chubby little lip pencils and better yet budget friendly ones! The Black Opal Color Stick Lip ($7.95) is a new, limited edition online exclusive twist up chubby lip pencil that give lips a burst of gorgeous creamy color. Black Opal Color Stick Lip are available in five shade selections and are formulated with a blend of she, cocoa, and illipe butters as well as Vitamin E and C to keep lips smooth and moist during the wear. These come housed in a chubby little twist up pencil and provide lips with a full color finish. There available for a limited time so if you want ’em grab them now before they disappear! Now Black Opal Color Stick Lip Pencils actually are a step above and beyond your typical twist up chubby lip pencil. Why? These are actually a full color experience! 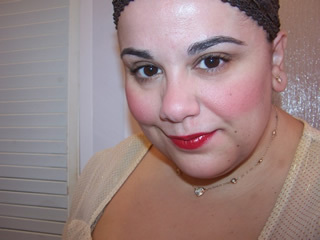 Most chubby pencils give lips a hint of color but few are as pigmented as a lipstick. Black Opal’s formula is actually quite pigmented and provides full color on a single swipe! These have the creamy consistency and color of a full lipstick but come in a convenient easier to apply and travel with lip pencil. Color applies beautifully on my drier lips with a smooth texture and a slightly frosty finish on both shades I tried! I know the frost finish likely scares some people but these have a nice hint of a shine once applied and that eliminates the frostiness a good deal! I get a solid five hours of wear from the shade Cordial and four hours from the other shade I tried Carousel. I detected no flavor or fragrance in either shade for those sensitive users. These are definitely unique among the chubby lip pencil world. The color and coverage of a lipstick plus the long wear of one makes these little pencils a great little pick up! Add in the fact they have a sweet budget price tag and you’re covered across the board! Black Opal Color Stick Lip are available for a limited time online at www.blackopalbeauty.com. Oooh, I’m loving on those, too! Those are really pretty, glad to see they got a great review! Carousel has my name written all over it. Just lovely. Thanks for the review.